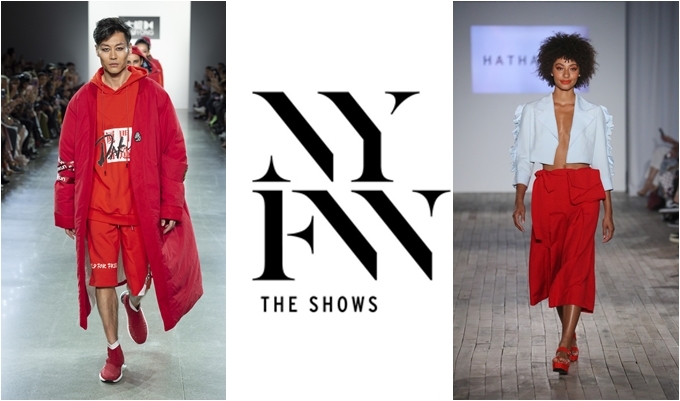 On September 12, designers Dakun x Liu Yong and Hathairat showcased their Spring/Summer 2019 collections at NYFW. With complete opposite sides of the spectrum, Dakun x Liu Yong puts an athletic spin on the high sport while Hathairat brought a bright future to ruffles and tones. Keep scrolling to see more. Dakun x Liu Yong debuted with their Eastern Legends streetwear collection proving that Chinese designers are the trailblazers of street fashion. Traditional Eastern culture has influenced the fashion industry profoundly. Liu Yong took this influence, particularly Taoism one of the most powerful cultures in Asia, into his atelier as the inspiration for this season’s Dakun x Liu Yong runway show. The Dakun name has the symbolic meaning of Taoism, which represents the blended Chinese ancient culture with new fashion trends. Liu Yong’s inspiration came across with luxurious fabric coatings, knitted borders, and intricate edging on the garments. Street elements were clear with the materials used and strategically placed graphics and logos. Male, female, and the cutest children’s looks came down the catwalk in edgy, futuristic reds, army green prints, and black. Accessories like sock slide on sneakers and architectural backpacks complemented Liu Yong’s anorak, hoody, and sweatpants pieces. The designer wanted to express throughout his show his concept of Eastern Legends. Dakun x Liu Yong aims to incorporate typical Chinese fashion with the younger generation. Hathairat Maneerat, the Bangkok born designer, showcased her Spring/Summer collection in Soho. This collection, as well as others, have a global influence in the multi-wearability of” hard-to-miss” statements. In all of which can be seen throughout her designs. Hathairat’s initial designs are fit and flare and color blocking, combined with various luxury fabrics. All including fine detail of ruffles, multiple layers, and voluminous look and feel. Her whimsy and elegance are inspired by themes from her personal styles, fantasy, luxury, cultures, and society.